The members of the Lewis and Clark Expedition camped a short distance south of here on the Nebraska side of the river, on July 15, 1804. They had covered nearly 10 miles that day, most traveling in a 55-foot keelboat, two pirogues, and dugout canoes. Clark and two men, however, walked along the river surveying the land. Clark noted in his journal that they had to cross three small streams, including the Little Nemaha River. He described it as "a Small river, about 100 yds. above the mouth it is 40 yards wide." He swam across, recording the extensive prairies between the hills marking the Missouri River floodplain. He noted the abundance of fruit: "I Saw Great quantities of Grapes, Plums, or 2 Kinds wild Cherries of 2 Kinds, Hazelnuts, and Goosberries." Soon after embarking the next morning, the expedition's keelboat caught on a snag in the river. Despite the delay, the explorers traveled 20 miles on July 16. 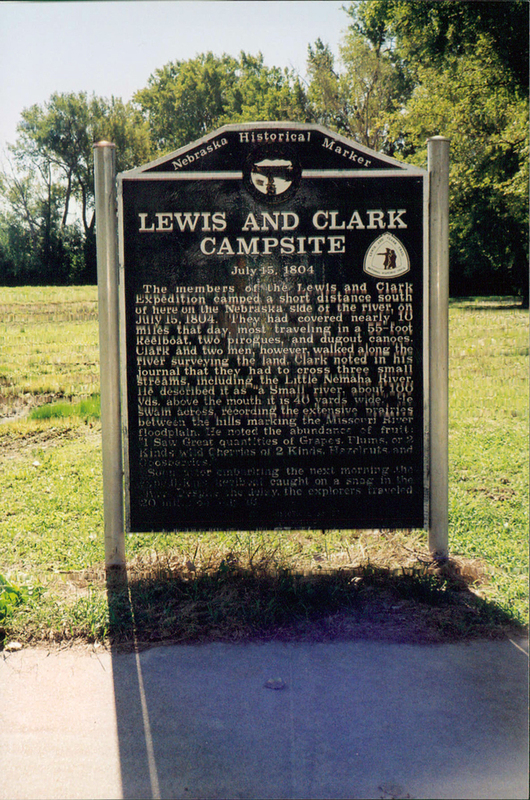 “Lewis and Clark Campsite: July 15, 1804,” Explore Nebraska History, accessed April 19, 2019, https://mynehistory.com/items/show/374.